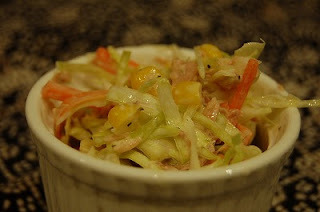 This is my coleslaw salad. It is easy made, cabbage, carrot, corn and tuna....marinaded with mayonnaise, yogurt and lemon zest, vinegar. Actually, I made a lot. It was supposed to have for dinner with my darling. But he had got plan, so I had to have it by myself. I was thinking how I could eat it all. As sandwich for lunch.... water would come out and bread would be wet. How about pita bread?? 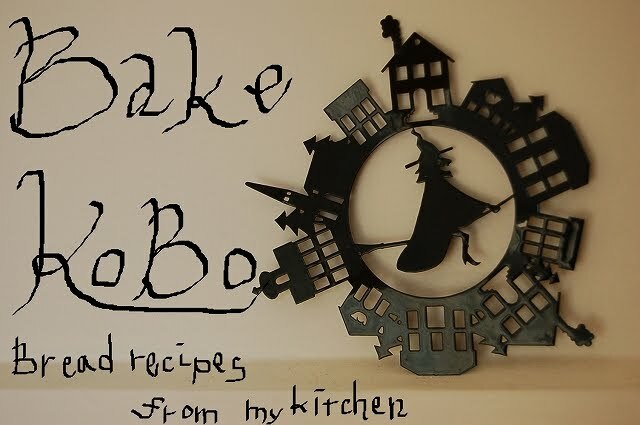 I have never baked it yet. And I could have it for my breakfast, stuff the salad and just eat straight away. This recipe is small batch. 200g of flour. I made 3 small ones, or it could be 2 loaves. 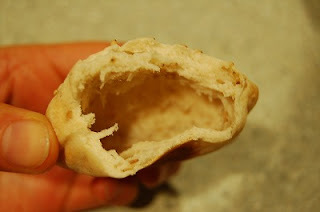 Pita bread doesn't need 2nd proofing before baking. And bake it at high temperature (300℃) for short time. Unfortunately, 250℃ is the highest at my oven. I baked them at 250℃ for 6 minutes. I recommend high temperature baking if you have. 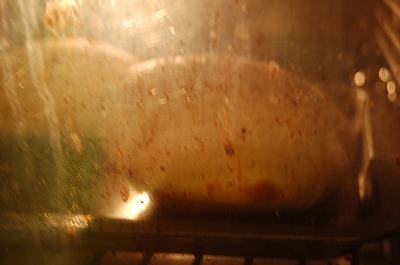 Keep looking the oven during baking, once the dough starts to swell, keep baking until it becomes brown colored. It will not be long. It was quit fut to keep watch the oven. You could see how bread is swelling. I add sesame seeds. 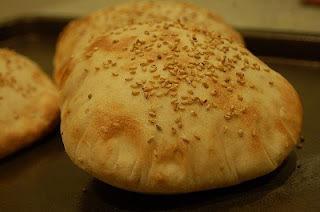 When you open the oven on finishing to bake, you could smell nice sesame aroma.But I write plain pita bread recipe, here. 1.In the mixer or bread machine, combine flour, salt and sugar. Add yeast and water, olive oil. Mix it 10 minute till it becomes smooth and elastic. 2 . Put it into the container, then proof it at warm place (30℃) till it becomes bigger size (about 1 hour). 3. Pour the dough onto floured counter, then deflate it, knead briefly. 4. Meanwhile, preheat the oven with baking tray at 300℃. 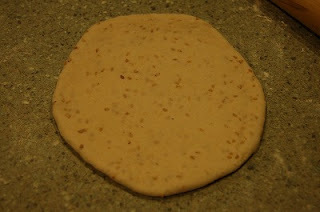 Divide the dough into 3 (120g each) .Using a rolling pin, roll it out into about 12cm round. 5. Take out the baking tray from the oven, apply the oil spray. Place the dough on the tray, and bake them in the oven. 6. Cool them down on the wired rack. 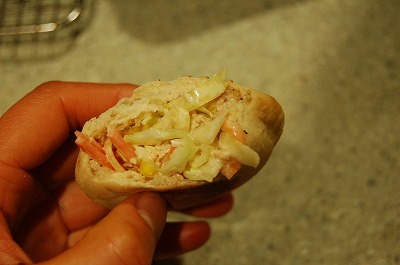 Make your own pita sandwich!! I placed it on Yeastspotting!